ABG, also known as Porzellanfabrik von Alt, was founded by Gottlieb Beck and Theodor Gottschalk and joined by Friedrich Alt and Christian Ernst Reinhoild in 1881, located in Nauendorf near Ohrdruf, Stutzhaus, Germany. 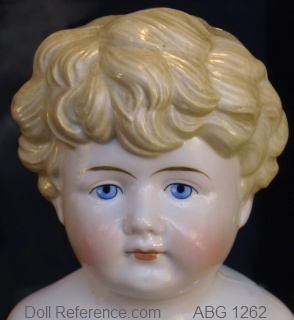 They produced antique bisque or China head dolls with kid, cloth or composition bodies, beautifully detailed child, lady and character baby dolls, all bisque dolls, as well as decorated pottery from 1854 to around 1941. Reference books have identified more than 50 mold numbers between 639 to 1304 that have been attributed to Alt, Beck & Gottschalck, most are shown with images including ABG doll marks, on their own page located here. ABG is also credited with making; Baby Bo Kaye, Bonnie Babe, Bye-Lo Baby, My Girlie and (probably) Gladdie bisque head dolls distributed by Borgfeldt and K & K Toy Co.
ca. 1880s ABG China shoulder head doll mold 1000, 16-28" tall, body of kid or cloth with bisque limbs or combination, molded painted hair, some wigged, painted eyes, some have glass eyes, closed or open mouth, most have pierced ears. ca. 1880 ABG bisque shoulder head dolls, 15-23" tall, bisque shoulder head on a kid leather or cloth with bisque limbs or combination body, glass or painted eyes, wigged, most have closed mouths, some are open mouth, most have pierced ears. ABG Dolly Face Child doll, 14-36" tall, bisque socket head on composition and wood jointed body, wigged, glass sleep eyes, open or closed mouth. My Girlie doll mold 1362 was distributed by George Borgfeldt. ABG Baby doll or Toddler doll, 10-30" tall, bisque socket head, bent limb multi piece jointed body, wigged, glass sleep eyes sometimes with flirty eyes, open mouth with teeth and tongue. ca. 1911 ABG Girl Doll, 5-8" tall, all bisque jointed chubby body, wigged, glass sleep eyes or stationary, painted open mouth, molded painted socks and shoes. 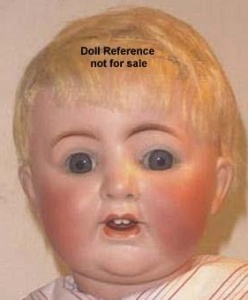 One all bisque doll name found is; Our Darling Baby doll, box marked 83/100. George Borgfeldt distributed dolls with bisque heads by ABG: My Girlie doll mold 1362, Bye-Lo Baby doll molds 1369 and 1373, Bonnie Babe doll mold 1386, Pretty Peggy (Grace Corry Rockwell design) 1391, doll mold 1402 (an Averill design), Baby Bo Kaye doll mold 1407, Gladdie doll mold 1410, Aero Baby or Fly Lo Baby doll mold 1418, Babykins dolls mold 1435. All these dolls are shown on the Borgfeldt page link.